-April turned out to be something of an uneventful month for me, which isn’t so bad. After all the good news and happening of March, it was nice to have a little more mental space to work in. I took a week off work and did a big revision of my short story collection, How to Die Young in Nebraska. A few stories were cut, I combined a few into a novella, and rearranged all of what was left into something kind of new. I took part in the initial screening for the Prairie Schooner Book Prize this year, and I tried to apply the lessons I learned from that experience as a screener/editor to my own collection. Hopefully it’s much better. I think it is. It’s a little shorter than before, the overall quality is a little more consistent, and the sense of narrative flow has been enhanced. We’ll see if there’s much of a response, as I have it out to a couple contests and small presses now. -One thing I did a little different in my editing of the collection was to let myself revise older, published stories. My old agent was usually against this practice, maybe afraid that I would undo the magic of a piece by tinkering with it after it had already been edited and published. There’s a certain logic to that, but I felt it was time to make some smaller changes. My main motivation was thinking that I’m not exactly the same writer I was two or three or five years ago, and that the collection read a little too much like a fossil record of my stylistic changes over the period that I’ve been working on the book. Since I didn’t like that, I tried to make the book more consistent in style as well. That seems to make a lot of sense. Common sense even. -Speaking of PS, Kwame Dawes was officially announced as the new Editor of Prairie Schooner. The last two years have been a little uncertain, as we looked for someone to replace longtime editor Hilda Raz, and I’m excited how it turned out. -Darren and Lacey had their wedding this past weekend. Congrats to the Keens! -I finally framed and hung a piece (see photo) that I made when I was at the Kimmel Harding Nelson Center for the Arts in March 2010. 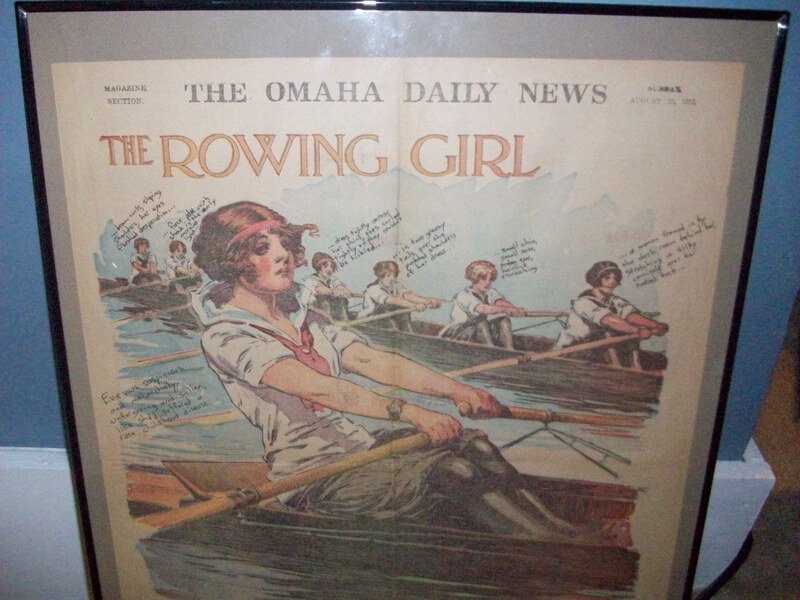 It’s pretty simple: an original Sunday supplement insert from the Omaha Daily News, from August 1912, on which I inked different descriptions of women that I wrote during my residency at KHN. I found the newspaper at an antique shop down the street from the arts center. It only took me a year, but I finally got the thing up on the wall, and I like it. -Flatmancrooked officially called it quits in April. Here’s what I had to say about it. -Looking ahead to May, The Cincinnati Review featuring my prize-winner, “The Current State of the Universe,” will be out on newsstands and in mailboxes. So get ready to hear more about that. “Attend the Way” was named a finalist in the Summer Literary Seminars’ Unified Fiction Contest. Kind of a slow month for rejections. I don’t really have that much stuff out there right now. Greetings from Below by David Philip Mullins. A very nice collection that I’m in the process of reviewing. The final three stories are exemplary, and they make for a knock-out conclusion to the book. I can’t recall another collection that sprints to the finish as much as Greetings from Below does. Usually it’s more of a ruminative, self-reflective inching forward that gracefully puts an end to the proceedings, but GfB doesn’t really follow that format too much, which is good. My American Unhappiness by Dean Bakopoulos. I’m still not really sure what to make of this book. It’s kind of chick-lit for thirty-something men, if that makes any sense. There are long stretches of great, interesting writing, but the first-person narrator is very glib and kind of a frustratingly clueless person at times. MAU will probably reignite some of the debates about unlikable lead characters that raged last year with the release of Jonathan Franzen’s Freedom. The Cailiffs of Baghdad, Georgia by Mary Helen Stefaniak. < MHS Takes Home Award!